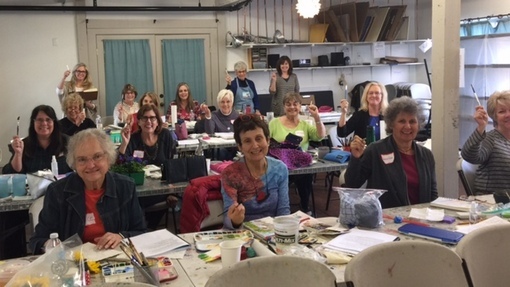 2018 Workshop Schedule - Come and Join the Fun! 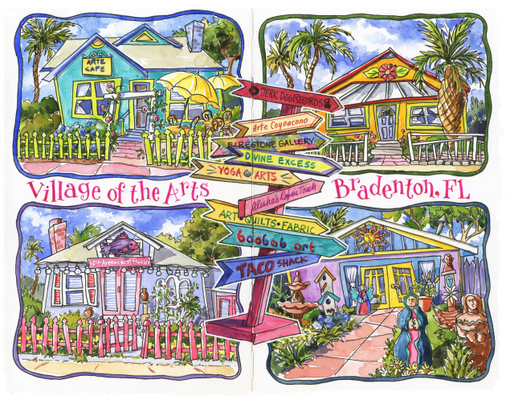 My first workshop of the year will be in a new location for me, Keeton's Art Supply in Bradenton, Florida. They have a fantastic new classroom with plenty of work space for the students and a multi-media system for the instructor, so everyone can easily see all the details of the sketchbook pages I share. I'll be teaching a two-day workshop called "Sketch Your Life: An Introduction to Sketchbook Journaling" January 29-30, 2018. 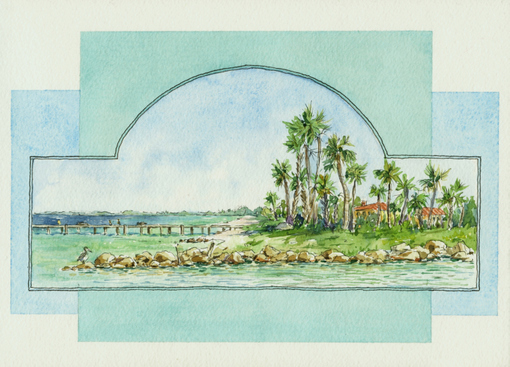 While I'm in Florida, I'll be stopping by Marie Selby Botanical Gardens for "Painting Flowers in Watercolor", February 1-2, 2018. I'll be mixing things up a bit in this class. 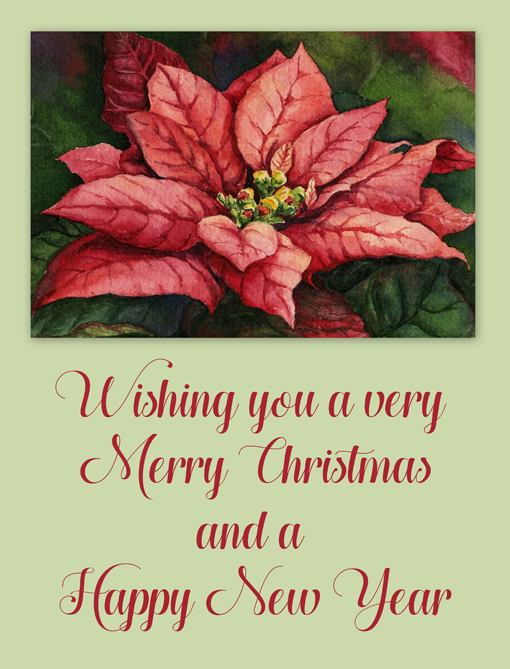 The first day we'll make an accordion-fold watercolor journal and paint several varieties of flowers in it, like roses, poinsettias, hibiscus, and orchids. 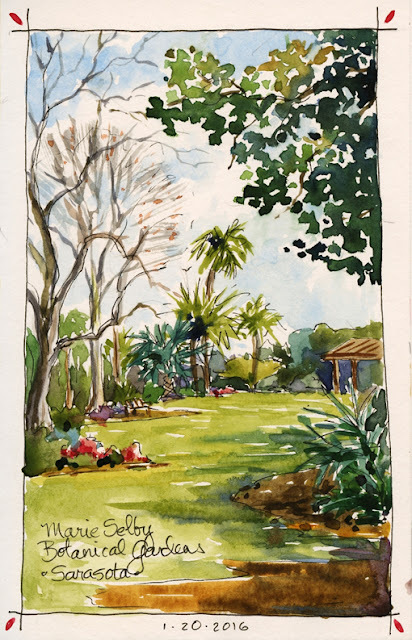 The next day, we'll venture out to draw some of the flowers that are blooming in the Selby gardens, then finish up our floral studies back in the studio, where I'll be available to guide and assist. 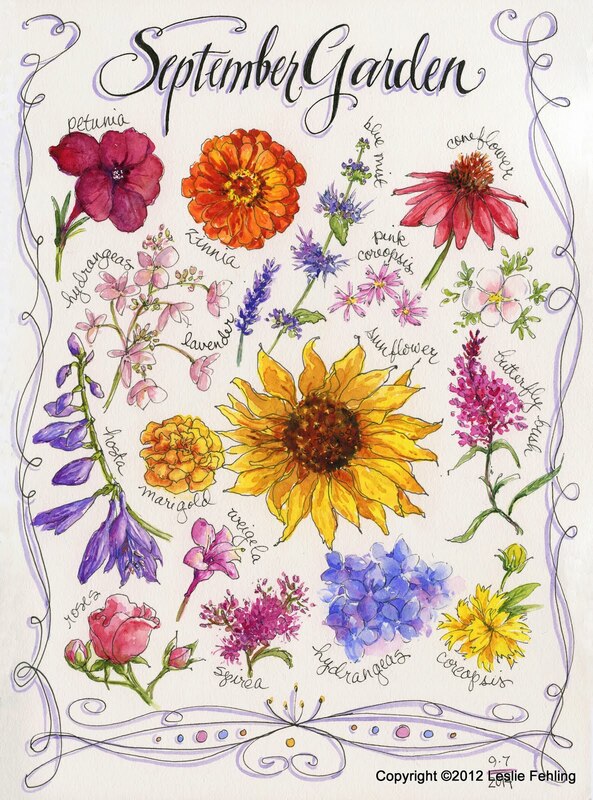 The end result: a beautiful handmade journal filled with colorful floral vignettes. April 3-8, 2018, will find me on the west coast for my "Watercolor Sketching in San Francisco" workshop with French Escapade. 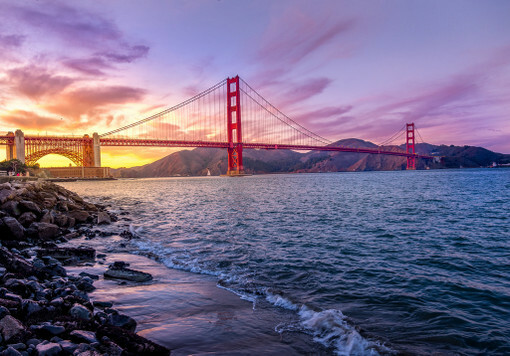 We'll have four days in the city, painting iconic spots like the Golden Gate Bridge and Fisherman's Wharf, and we'll venture afield one day for a visit to the wine country of Sonoma County. All the details will be taken care of - just come and enjoy! Read all about the workshop in this post and register on the French Escapade website. 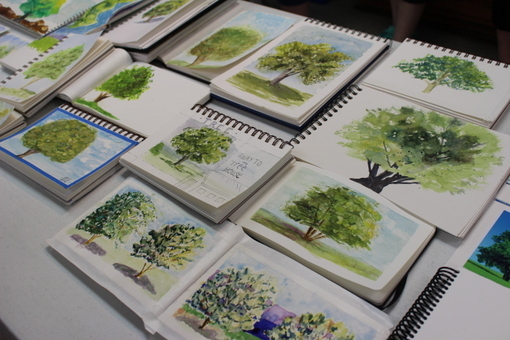 In May, I'll be returning to Cheap Joe's in the beautiful Blue Ridge Mountains of North Carolina for my 5-day "Sketchbook Journaling Comes to Life" workshop. The facilities at Cheap Joe's are the finest I've found anywhere, and the southern hospitality that the staff always shows toward me and my students makes this one of my favorite teaching venues. We'll be spending the week exploring how to bring your sketchbook pages to life with exciting page designs, varied lettering styles, and creative subject matter. 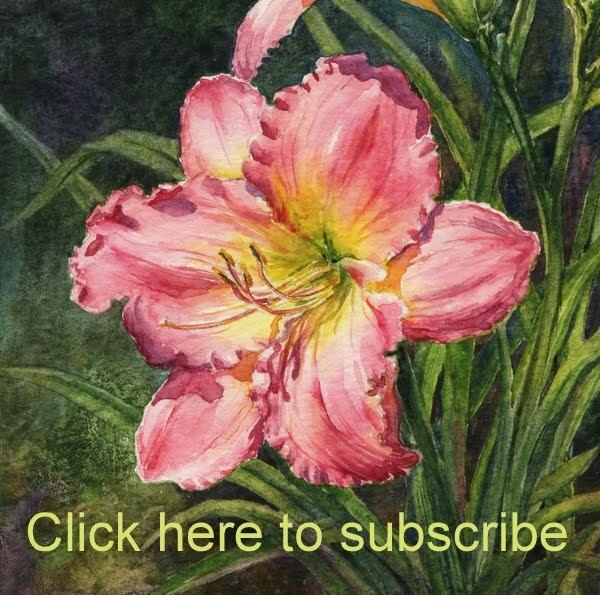 And I'll give you plenty of pointers on watercolor technique, too, so you can enjoy the painting process instead of stressing over it. So, come along with me on a spring road trip to Cheap Joe's, and enjoy sketching, painting, shopping (for art supplies! ), feasting on yummy southern cooking, and exploring the quaint little town of Boone. I promise you'll love it! Register for the workshop on the Cheap Joe's website. 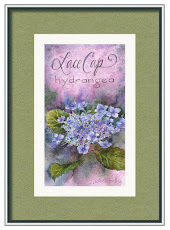 When summer rolls around, I always dream of Maine, where wild purple lupines cover the hillsides in early June. This year, my dream will come true as I host two week-long painting retreats at Primrose Cottage in Owls Head, Maine. There's nothing like a week in Maine to recharge your creative spirit! We'll visit beaches, lighthouses, gardens, harbors, and towns, recording our impressions on the pages of our travel journals. I'll share tutorials on painting rocks, water, skies, as well as give you tips on keeping a travel journal. But there will also be hours of free time to spend as you will: watching the tide roll in, searching for sea glass on the beach, reading a book, or going for a walk. This is a time to connect with kindred spirits and reconnect with yourself. 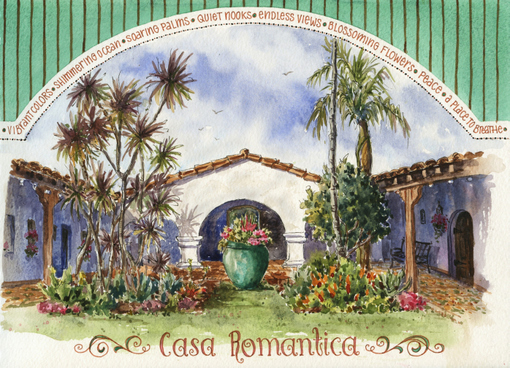 There are only a few spots left on this very special painting retreat. Click here for more information. Then, in August, I'll be back in Boone for another week at Cheap Joe's - this time for my "Step-by-Step Watercolor" workshop. This class will feature five days of lessons on how to paint a wide range of subjects, everything from a wine bottle to a crashing ocean wave. And, as with all my classes, I provide a full-color spiral-bound handbook for each student that contains all the step-by-step lessons we'll be covering during the week. It's a reference that can be referred to for years to come. These lessons teach the techniques that I use in all my sketches and paintings. Once you learn them, you can paint anything! 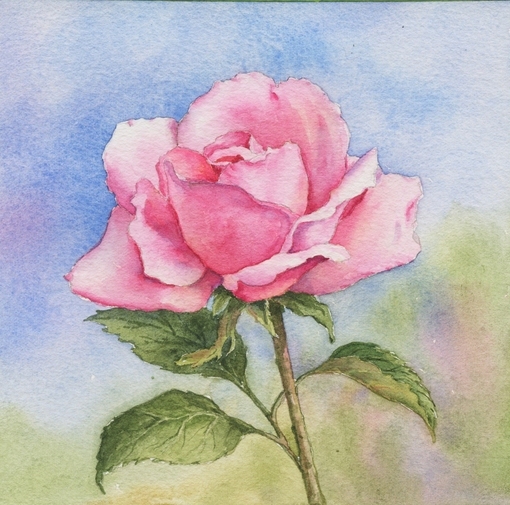 Register for "Step-by-Step Watercolor" here. 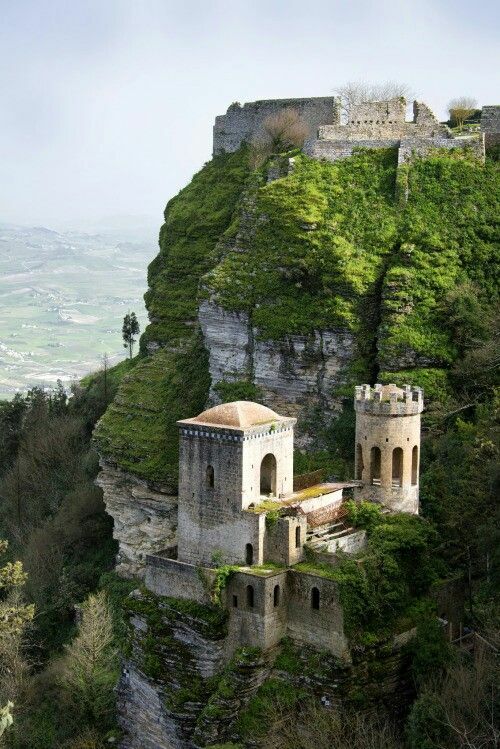 After Boone, I'll start packing for Italy. 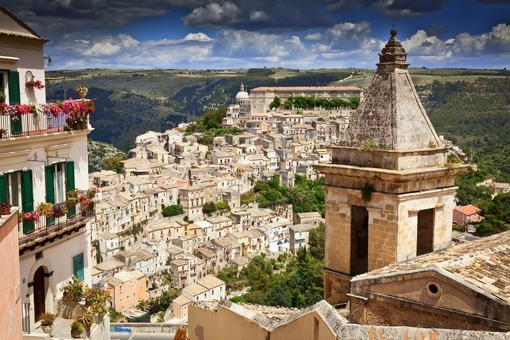 I'll be teaching back-to-back workshops in two new locations - Sicily and Northern Italy. September 15-22, 2018, is my week-long sketching workshop on the island of Sicily. Its varied landscape, sparkling waters, and historic sites make it the jewel of the Mediterranean, and we'll be painting those blue waters, towering cliffs and ancient Roman temples in our travel journals as we explore this incredible place. Visit the "Sicily Workshop" page, or, to see the full trip itinerary, click here. This workshop (through Artravelitaly) is filling fast, so reserve your spot soon to get the best choice of rooms at Villa Salinara, our host hotel. After I wrap things up in Sicily, I'll fly to Milan to meet up with the folks from the Blue Walk to begin my sketching tour of Northern Italy. 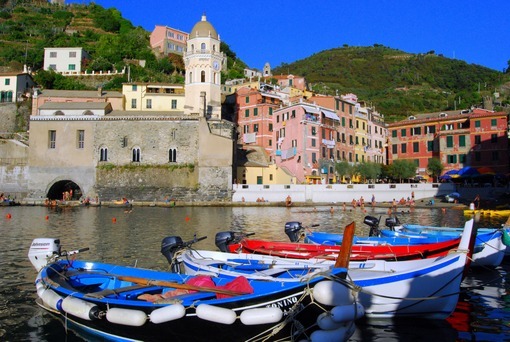 This workshop tour will start out in Milan, then take us to the Italian Riviera towns of Portofino and Rapallo, with a side trip to Cinque Terre, which is quite possibly my favorite place in Italy. 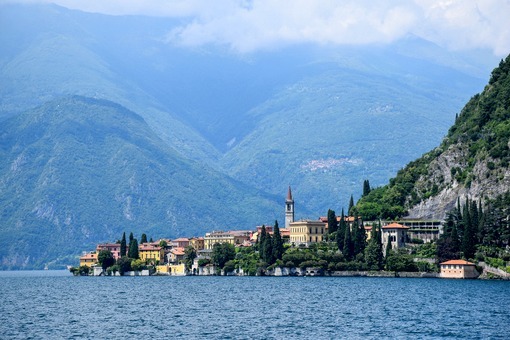 Then we're off to Lake Como for days of cruising, sketching, shopping, and exploring the historic villages that dot the shoreline of this gorgeous lake at the foot of the Alps. Sound good? Visit the Blue Walk website for a full itinerary, plus registration information. We've even added an optional 3-day trip extension to Venice, Padua, and Verona, so, if you just can't get enough of Italy, check it out and think about joining us. 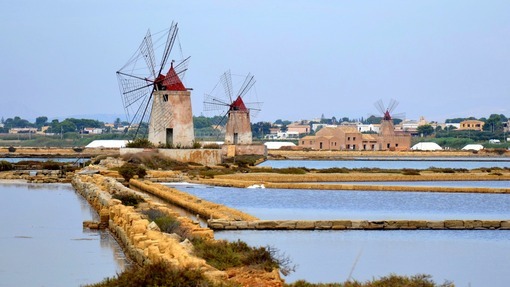 Each one of these European trips offers safe small-group travel to gorgeous locations. And all the details are taken care of for you. 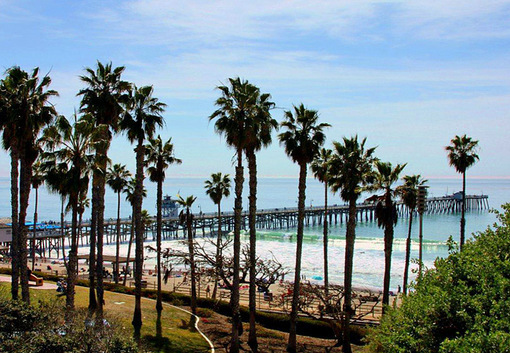 It's the perfect way to get away! When I return from Italy, I'll barely have time to catch my breath before flying off to San Clemente in November for back-to-back workshops at San Clemente Art Supply. November 2-3, 2018, I'll be teaching "Sketchbook Journaling Explorations", a fun, playful two-day class where we'll explore a variety of new techniques and materials that will inject new life into your sketchbook pages. 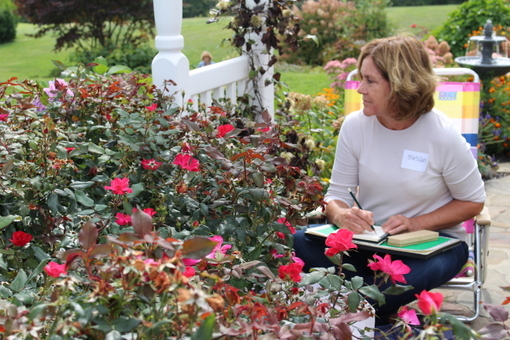 Then, on November 4-5, we'll be heading outside for some on-location sketching during my "Sketch Your World" workshop. 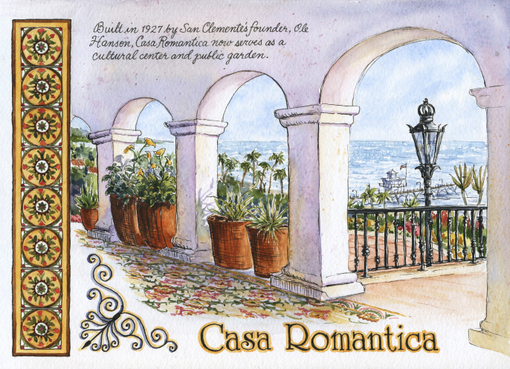 Locations have not been finalized yet - I'll be announcing them over the summer - but I'm sure they'll be just as wonderful as our visit last year to Casa Romantica. 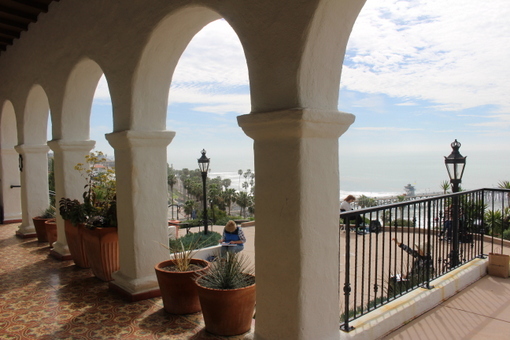 Everyone's sketching practice can use a dose of inspiration now and then, so come on over to beautiful San Clemente and get jazzed about sketching! Call the store to inquire about registering: 949-369-6603. 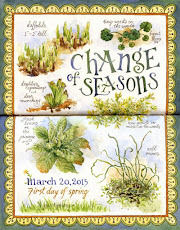 Student sketches from a class entitled "50 Ways to Sketch a Garden"
we always have a great time together. 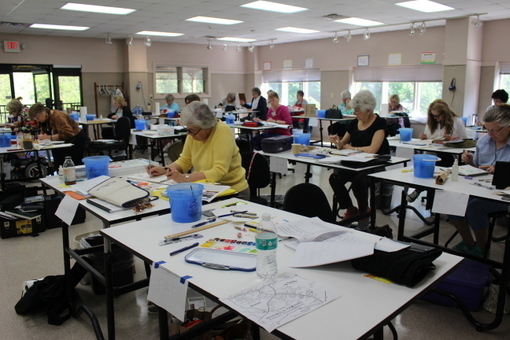 Each class consists of a step-by-step watercolor tutorial, free time for sketching indoors or out, and a delicious homemade meal. We always end with a sharing session where everyone can show off what they've been working on lately. Sometimes I think the sharing time is the best part of Summerhhill Sketching. Everyone leaves happy and inspired (and full, from all that delicious food my mom and I make for them!) To see all the 2018 Sketching at Summerhill dates, click here. I may add a few more classes here at my home studio in the coming year. Let me know if you're interested in an "Intro to Watercolor" weekly class, or a 3-day "Sketch Your Life: An Introduction to Sketchbook Journaling" workshop. I might be able to squeeze them in - drop me an email to let me know. To see detailed descriptions of all of my 2018 US workshops, click here. I hope to see you in class in 2018. It's going to be a GREAT year! 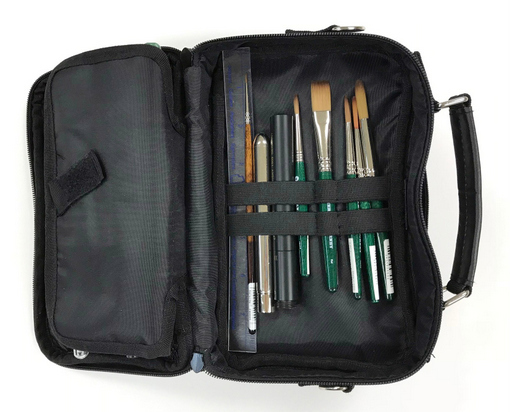 My carrying case is the Kutsuwa Dr. Ion Super Mega Pencil Case. I carry it, along with my sketchbook, jacket, wallet, water bottle, etc., in a backpack whenever I'm out and about. 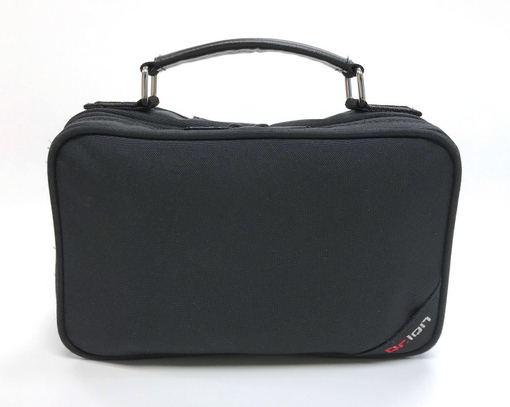 There are two main zipper compartments. 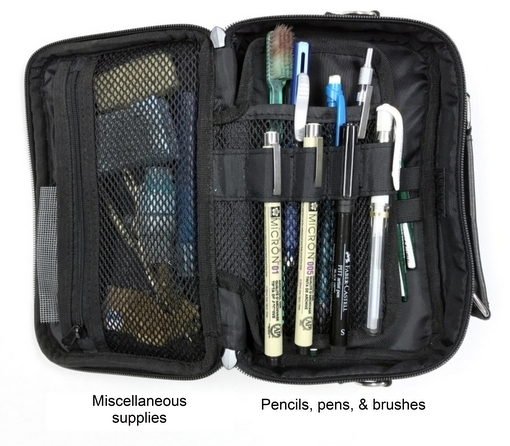 In one I store my pencils, pens, paintbrushes, and miscellaneous supplies. 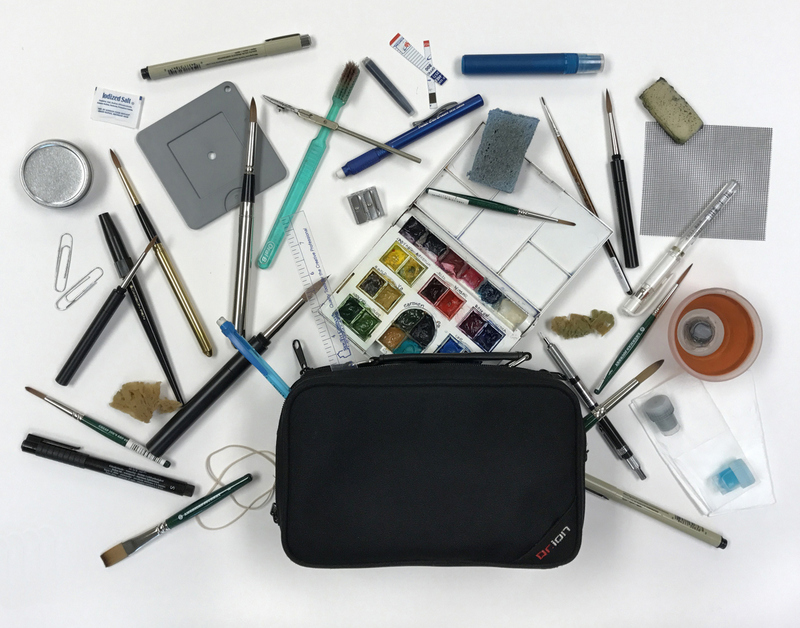 In the other, I stash a small palette, a kneaded eraser, and a few more small travel brushes. The elastic straps that hold the paint brushes in were too loose on the original, so I hand-stitched some additional seams on them to divide the brush-holding area into smaller sections, as shown below. and the tiny water cup that's part of the set. That gives me 24 colors in a palette that measures only 4-1/4" x 5-1/4". The paints are American Journey (from Cheap Joe's Art Stuff), Winsor & Newton, Daniel Smith, and Holbein. The colors I've included are ones I'm familiar with and tend to use often, but there are many others that would work just as well. I like this little palette, because it fits in my Dr. Ion case, it holds a good number of colors, and it has a decent-sized mixing area. 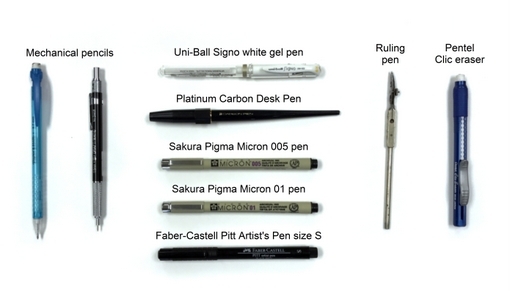 For drawing, I carry mechanical pencils, Sakura Pigma Micron pens (sizes 01 and .005), a Faber-Castell Pitt Artist's Pen (size S), a Uni-Ball Signo white gel pen, and my favorite fountain pen, a Platinum Carbon Desk Pen with Platinum Carbon black ink cartridge. I also bring along a ruling pen to use with masking fluid, and a Pentel Clic eraser. A kneaded eraser comes in handy for erasing a pencil sketch after it's been inked. 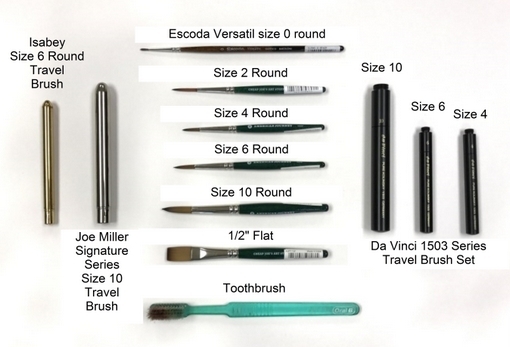 I also include a tiny size 0 Escoda Versatil for filling in Roman-style lettering, and an old toothbrush for spattering. A collapsible water container with a magnet hot-glued to the bottom. It attaches to my Coroplast plein air setup, detailed in this post. A tiny bottle of Dawn dish detergent. When I want to use a brush to apply masking fluid, I dip my paintbrush in Dawn, make sure the bristles are coated, then wipe off the excess before I dip into the masking fluid. The container I use to carry it in my sketch kit is a "Dinky Dip" from John Neal Bookseller. Pebeo Drawing Gum (masking fluid) in a Dinky Dip container. 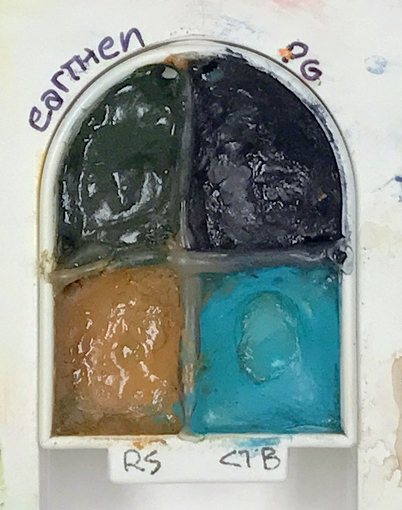 Used to preserve the white of the paper or to mask at any stage of the painting process. Natural sponge. 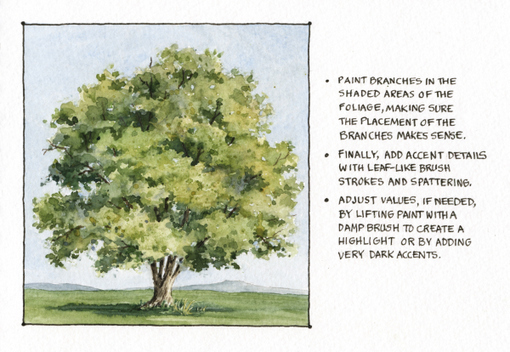 Great for adding texture when painting trees, rocks, and other natural landscape elements. Pencil sharpener. This one has two sizes of holes. Paper clips for clipping sketchbook pages together on a breezy day. Tissues. Used for blotting/lifting paint or to remove excess water from a brush. Fine mist sprayer. 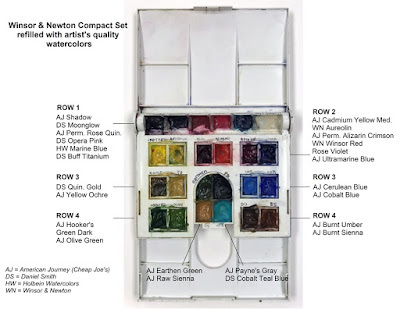 Used to moisten paints in the palette, wet my paper, or spritz paint to help it move on the paper. A piece of window screen for spattering. Just dab on some watercolor, hold the screen over your paper and give a quick puff of air to blow perfect small spatters onto your sketch. Salt packet. I rarely use salt while sketching, but I always carry a packet of it, in case I need it for adding texture to rocks or beaches, or for painting a starry sky. Credit card pieces can be used for scraping into a wet or damp wash.
Rubber cement pick-up. 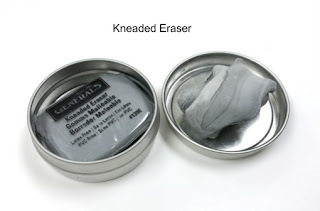 Used for removing dried masking fluid from paper. Kitchen sponge. This piece of kitchen sponge has Velcro stitched to one side. It sticks to my plein air setup board, and I blot my brush on it. Plastic viewfinder. I seldom use this, but I always demonstrate its use to my students, so it warrants a place in my kit. Ink cartridge. 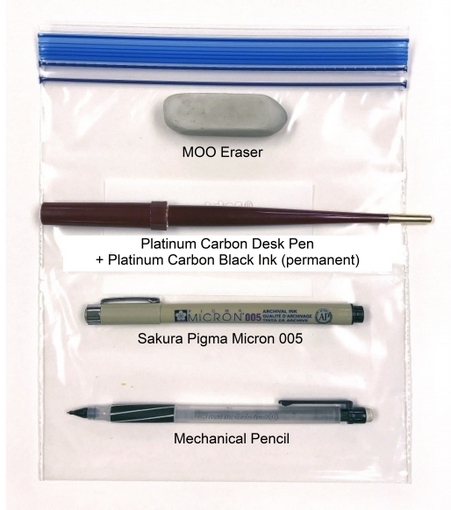 I usually carry a few spare Platinum Carbon Black Ink cartridges for my Platinum Carbon Desk Pen. The ink is permanent and waterproof. Ruler. You never know when you might need one! Rubber bands. I wrap these around the pages on my hardbound sketchbooks, to help hold them flat while I'm sketching. 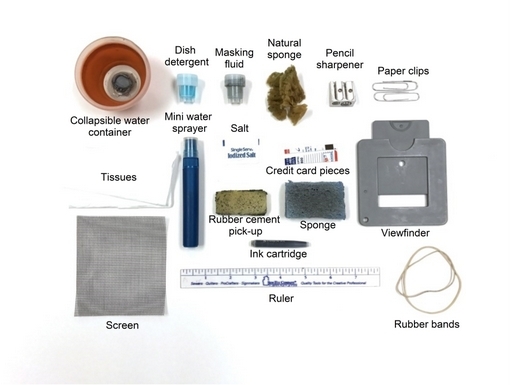 It's a quart-size Ziploc bag with a pencil, two pens, and an eraser tucked inside. 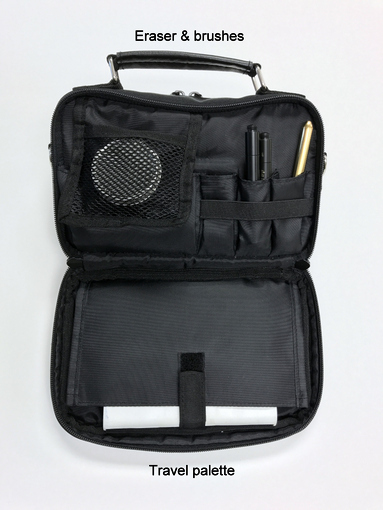 Honestly, I use this more often when traveling than I do the larger Dr. Ion kit. So often, I'm just adding a small sketch to a composite page, filling a box on a gridded page, or catching up on my journaling. At those times, there's no need to pull out all my supplies. A pencil and pen are all that's needed to capture the moment. 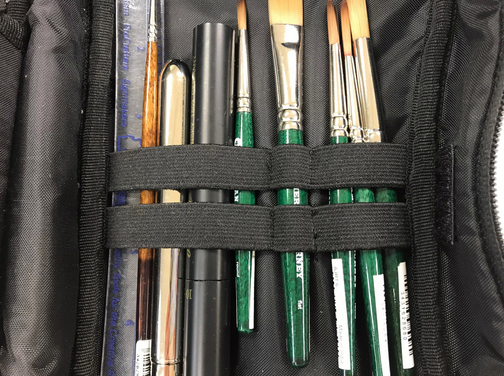 I always carry my sketchbook in a Ziploc bag to protect it from spills and wear, and I usually slip this "Minimalist Kit" into the same bag, so I can pull the essentials out of my backpack in one quick move. 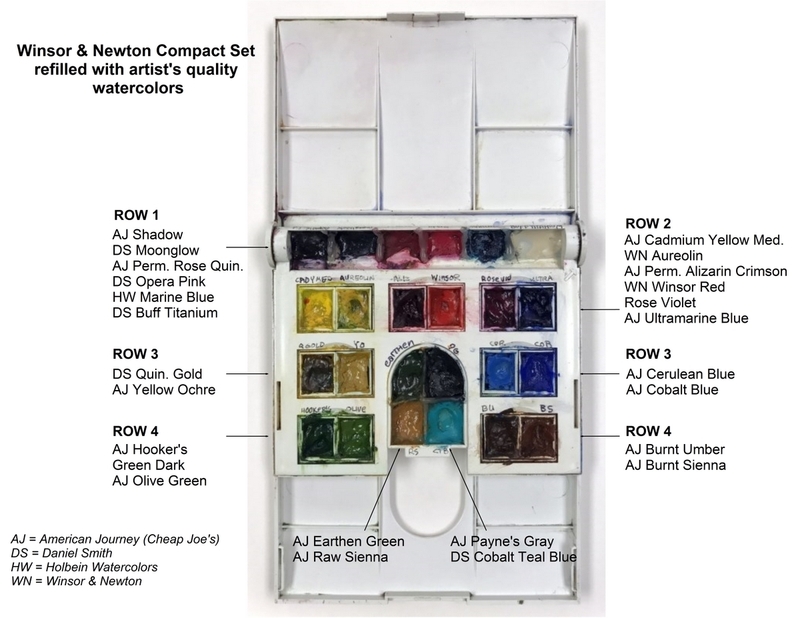 There is one additional supply that I take with me on trips - a larger palette. 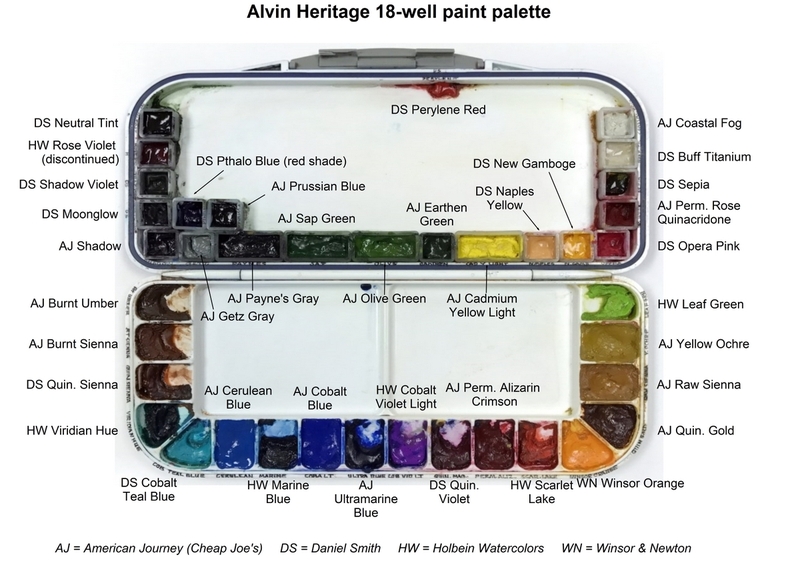 My choice is the Alvin Heritage 18-well plastic palette. It has a rubber gasket around the edge of the lid to prevent wet paint from leaking out. 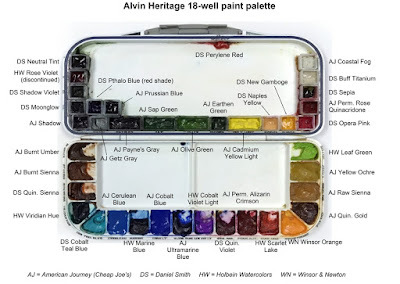 I like to use the Heritage palette when I'm painting in the studio or at a table, times when I have room to spread out a bit, rather than working in my lap. It holds a generous supply of paint and offers several good-sized mixing areas. The clear plastic insert in the lid is removable and can be used as an additional mixing area, but I filled mine with extra paint pans, so I never remove it. 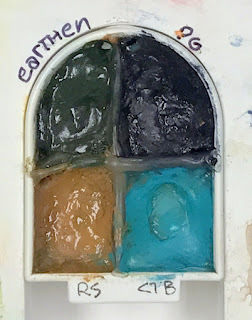 I glued an assortment of half pans and full pans into the palette lid with rubber cement, so I have room for some of the non-essential but useful and fun colors that I use often. grab a sketchbook and some supplies, get out there, and just do it! Remember, your sketches don't have to be perfect; it's the act of sketching that's important. It centers you and puts you in touch with the real and beautiful things in this world. Focus on what moves you, and sketch to remember it. If you're up for some travel sketching, why not come along on one of my 2018 sketching trips? Next September I'll be teaching workshops in Sicily and Northern Italy. 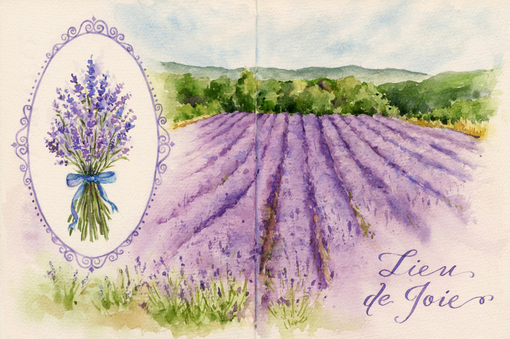 All the details are taken care of for you on these sketching vacations. All you have to do is enjoy! And I also have US workshops scheduled in San Francisco, San Clemente, Maine, Florida, North Carolina, and Pennsylvania. 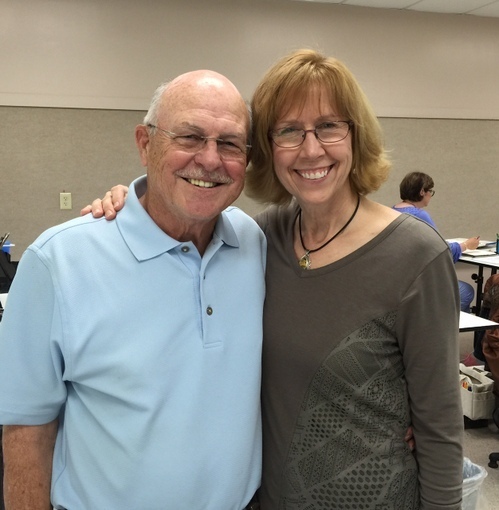 Read all about them on my US Workshops page. Come and join the fun - I hope to see you in 2018! travel sketching supplies one day? what fabulous places you're dreaming of!